Results from an archaeological investigation of the foundation of the Oregon City Woolen Mills will be presented next month after years of obscurity beneath the complex layers of human innovation. Oregon City commissioned a two-week archaeological investigation, beginning August 10, at the historic foundation of the Oregon City Woolen Mill located on the former Blue Heron property. The dig is funded in part by a grant from the State Historic Preservation Office (SHPO) and the property owner, Falls Legacy, LLC is led by Heritage Research Associates (Heritage) and aims to discover historic archaeologic deposits that may rest beneath the mill’s north wing basement floor. This investigation could provide useful information to the property owner, but is also intended to engage the public. This archaeological project is one piece of the larger Willamette Falls Legacy Project - a unique redevelopment effort comprised of four government entities: Oregon City, Clackamas County, Metro, and the State of Oregon in collaboration with Falls Legacy LLC, the site owner, to redevelop the former Blue Heron Paper Mill and reestablish the significance of the Willamette Falls to Oregonians. Since 2011, the project has been working to create public access to the falls and the historic industrial property, which was Oregon City’s original Main Street. The Oregon City Woolen Mill is the oldest remaining structure on the property, and archaeologists believe, after reviewing numerous primary sources and photographs, that the site could yield objects dating back to 1865 or earlier. Curran said they think there is a high probability of finding artifacts, but are still unsure what that will be. The team is not expecting to find prehistoric artifacts, but is prepared for such a scenario. An 1874 view of the rebuilt Oregon City Woolen Mill. The adjacent wood buildings, and site of the current archeologically investigations, would soon be demolished to build the north addition. Elaine Dorset prepares the trench on the first day of the investigation. The property owner, Falls Legacy LLC, agrees and helped finance the dig as a test case for future site development that may trigger other archaeological investigations. There is, of course, a chance the investigation yields few discoveries. Much of the evidence could have been flushed out over the solid basalt surface and into the capricious Willamette River. There is also the possibility that artifacts were removed or destroyed during previous construction projects. Still, the crew is hopeful they will find something for the fruit of their labor something that will lead to a better understanding of the region’s rich heritage. “Willamette Falls was a highly significant gathering place for American Indian people for thousands of years, and even though there has been a certain amount of alteration, it is still one of the few remaining locations where descendants can continue traditional practices,” Dorset said. The Willamette Falls served native tribes as a strategic center of commerce and culture. Tribes were drawn in from the eastern and western banks to harvest the falls’ natural bounty of salmon, lamprey, and smelt. Chinook legend says Coyote, a key Chinook character, built the falls high and wide so fishermen could easily spear the salmon coming up towards the water surface. OAS volunteers hand sift materials taken from the trench. Over the past 150 years, industry became the dominant use at the falls mills dotted the industrial campus and produced paper, flour, and wool at a staggering rate. The Woolen Mill was constructed in 1865 and operated throughout the 20th century. During World War I, the mill made blankets for soldiers fighting in Europe. All that remains of the building today is the original basalt foundation, which resembles ancient ruins amidst scores of corroded metal structures characteristic of the rest of the property. One goal of this investigation, and the larger Willamette Falls Legacy Project, is to show the public the stories of life and experience surrounding the falls. 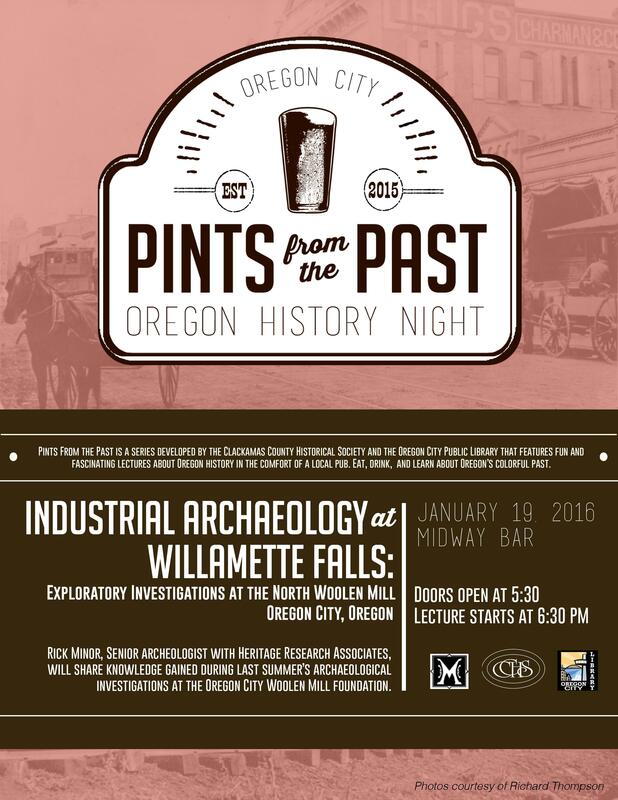 On Jan. 19, 2016, a free event will detail archaeological discoveries made at the Oregon City Woolen Mill site during this past summer. The fun and engaging event is the latest “Pints from the Past,” a discussion series and ongoing collaboration between the Clackamas County Historical Society (CCHS) and Oregon City Public Library (OCPL). Attendees can have dinner and drinks with friends while listening to free expert lectures on a topic related to the rich history of the Oregon Territory. CCHS and OCPL partnered with the Willamette Falls Legacy Project (WFLP) for this latest iteration. The featured event lecturer is Rick Minor, senior archaeologist on the dig. Minor’s training includes a B.A. in Anthropology from California State University Fullerton and an M.A. and Ph.D. in Anthropology from the University of Oregon. As Senior Archaeologist and co-founder of Heritage Research Associates, he has over 40 years of experience as a professional archaeologist. His record of research reflects a long history of collaboration with professionals in other fields, especially geologists and historians, making his partnership with Willamette Falls Legacy Project an easy choice. The Midway Historic Public House in Oregon City, at 1003 7th St., is set to host the event. Doors open at 5:30 p.m., the talk starts at 6:30 p.m.